The third ‘Big Walk’ organised by the Two Moors Way Association (Nos. 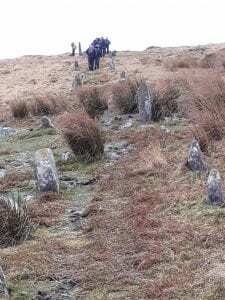 1 & 2 appear as entries on this blog in April and September 2018) took place on Saturday 6 April and attracted more than 60 walkers – some travelling considerable distances to be part of the event. Given that it had rained continuously from noon the previous day it was a wonderful surprise to set off in bright sunshine without even a hint of rain all day long. Walkers assembled in Chagford, from where they travelled by minibus to the start at Bel Tor Corner, high above the River Dart. 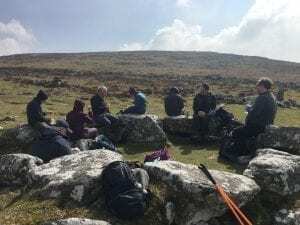 As it happens the walk coincided with the start of National Parks Fortnight, and given that our whole route was inside Dartmoor National Park this provided an opportunity to highlight the value of such wide open spaces. The route took walkers across wild landscape beside babbling brooks and fast flowing rivers – a deserted medieval village, an Iron Age settlement and a mystical double stone row. The variety, wildness and serenity of the landscape sums up why the Two Moors Way is such a wonderful walking route. ‘Big Walk 4’ is planned for Saturday 14 September.